Located beside a small pond in Seoul Namsangol Hanok Village, Cheonugak is an elegant Korean traditional pavilion. From the main entrance of Hanok Village walk for a few steps, the unique Korean Cheonugak is on your left. Watching the crystal clear spring and listening to the patter of rain in Cheonugak is truly poetic. 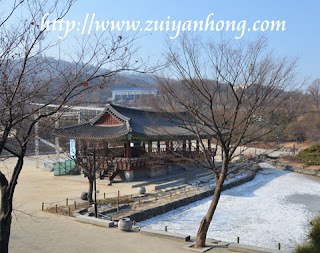 During my visit to Hanok Village, the water surface of the small pond still frozen. The weather is fine at that time. Therefore I missed the crystal clear spring and the tapping sound of rain. If boiling water for making tea as well as composing poems and couplets is available in Cheonugak that is pretty great.